In January last year I wrote an article on How I Planned To Get Things Done In 2017. Back then I decided that a completely paper-based system was going to be the most efficient one for me and one that I would be able to maintain easily. I stuck with a paper-based system for my personal calendar and the majority of my tasks and was able to keep up with everything however there were a couple of minor points that didn’t quite work for me and needed tweaking. You can read the full post about my 2017 system here but if you can’t read it right now then briefly I was using a Happy Planner for keeping my blog calendar and all of my tasks organised and used an A6 notebook for my personal calendar. Since my first post on my "Getting Things Done" Routine in 2006 I've been slowly working on revising my system so here's how I manage my task and diary items. I stuck with the A6 diary as it was small enough to carry with me everywhere and meant I always had my calendar to hand, which is really handy living in a fairly rural area with limited phone signal meaning that I wouldn’t always have access to a calendar on my mobile. I had decided to use my Happy Planner for my task lists and blogging calendar as the disc system allowed for the pages to be moved around, added or taken out without any problems. Whilst the flexibility of this system was fantastic, the size of the planner meant that I wasn’t able to carry it around with me everywhere (although there is now a mini size but that’s still a bit big for me). 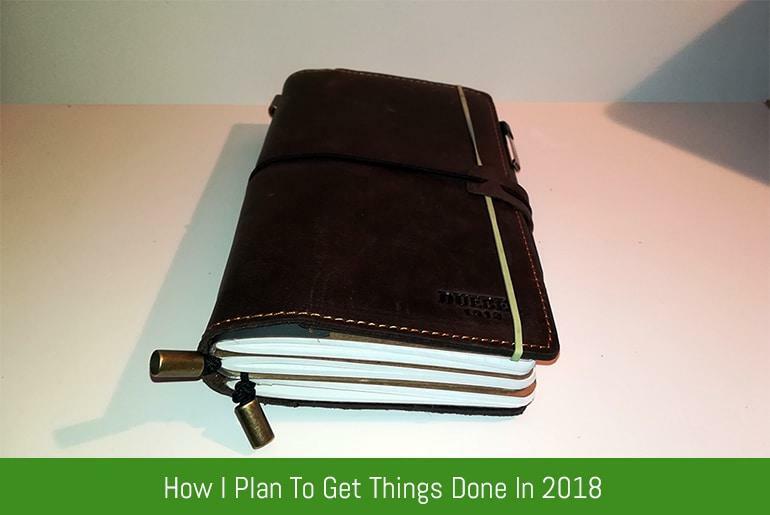 I thought about writing my lists in the back of my Calendar Notebook but my main concern with that was I would fill it up before the end of the year and end up having to come up with yet another system or migrate my calendar over to a new notebook – neither of which was an ideal or prtactical solultion. In the end I decided on writing my “on-the-go” tasks on paper which I could then safely store in the back of my notebook. Designed for Moleskine Pocket notebooks these A4 and Letter sized print-outs come in 4-per-sheet and can be printed double-sided or you can mix and match your pages. When I got home, I could then go through these notes and add them to the appropriate section of my Happy Planner. This was great as I am able to ensure all of my tasks are organised but it did mean that there is a lot of effort expended writing everthing down twice and that I didn’t have my tasks lists to hand away from home. So, for 2018 I decided that I needed to tweak my system slightly. I still wanted something that would fit in my pocket so that I could keep my diary and, most importantly, tasks with me at all time. Writing tasks in my diary was a non-starter as I knew I’d run out of room so after a bit of research I settled on a Travelers Notebook. If you’re not sure what a Traveler’s Notebook you can read an article about what traveler’s notebooks are and how to use them here. The great advantage of a travelers notebook is that is can hold multiple notebooks within it. I’m going to use one notebook for my diary and a separate one for my general tasks, blog and a collections (lists of movies and TV shows I want to watch, books I want to read etc.) and my “Someday/Maybe” tasks (although if I find I’m getting a lot of collections I’ll add them to their own notebook so I don’t have to migrate them when the old one is full up). The Traveler’s Notebook I purchased (on the left in the Amazon carousel above) came with 3 notebooks but the paper is really thin so I bought some replacements (2 grid and 2 dot). I used the grid to make my diary and each book will take 6 months of a week-to-view so I stuck the 2 grid notebooks together to get the full year. I’ll be using the 2 dotted books for my To Dos, Blog Tasks and my Collections. As the Traveler’s Notebook will fit in my pocket I’ll be able to keep my caledar and to-do’s with me all the time so I’ll be cutting down on the duplication of writing and hopefully never forget something that I’m supposed to be working on. I was using the Blog Planner I Devised which worked well, but again wasn’t portable so I didn’t have it with me all of the time which could make scheduling guest posts problematic if I was away from my office. This reworking of the "Ultimate Blog Planner" contains 15 PDFs to help you organise your Blogging schedule, post title ideas and post content. I also found myself having to cross off and reschedule publications dates quite a lot which made the calendar messy and caused a bit of confusion. Finally, potential Guest Authors couldn’t see free publication dates so I was spending a lot of time emailing the same information out over and over. I moved my website’s editorial calendar over to a Google Spreadsheet. This allows me to track all of the information about an article’s status in one place and I have linked it to a Google Calendar which I can display on my website so anyone can see available spots and titles of any upcoming posts (this reduces duplication of content a great deal too). The one drawback is not being able to move things around in the Google Calendar and have them sync back to the Google Sheet – but that’s something to be looked at later (if it’s possible at all). Article wise, I was also using my Blog Planner to keep track of my proposed article titles and to-do list but this meant that if I had a spare 10 minutes whilst out and about, I couldn’t write notes around any topic as I didn’t have the list with me! This shouldn’t be an issue now that I’m carrying my proposed titles with me in my Traveler’s Notebook. Hopefully, the flexibility of these new systems will cut down the duplication I experienced last year and help me save a fair amount of time in the process. How are you planning to organise your calendar and tasks in 2018? Let us know in the comments or send me an email.